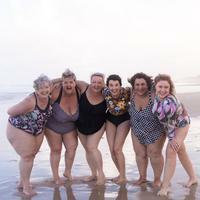 Womens' Swimwear Online in Australia for ladies of all shapes and sizes; and very well priced too. Our swimmers, including our plus size range from Capriosca Swimwear has loads of styles to flatter curves, busts and bellies. Bathers in plains and prints that all match and work well together to create stunning beach and poolside looks. Sizes 10-30. Whether it's a one piece, a tankini, bikini or a swimdress, this range not only looks incredible, it's cleverly designed for your shape so you're sure to find one that works for you! Under wire, shelf bras and wider straps for extra bust support. Some styles in DD, E & F cup. Power netting to firm up that belly and swim skirts for a bit more modesty too! All styles are available in Sizes 10 to 22 with some up to a 26 and F cup! Because we know it's tricky buying swimwear, we ship anywhere and promptly; offer Free Shipping for Aussie orders over $150 with Free Returns on any purchase (Clearance items excluded). Got a post baby belly or thighs you're keen to hide? Then head to The Home Page packed with great tips for living your best summer yet including Swimwear Fit Tips like "3 simple tips for big bellies" and more!